Voiniciuc, C. and Günl, M. (2016). Analysis of Monosaccharides in Total Mucilage Extractable from Arabidopsis Seeds. Bio-protocol 6(9): e1801. DOI: 10.21769/BioProtoc.1801. Voiniciuc, C., Schmidt, M. H., Berger, A., Yang, B., Ebert, B., Scheller, H. V., North, H. M., Usadel, B. and Gunl, M. (2015b). MUCILAGE-RELATED10 produces galactoglucomannan that maintains pectin and cellulose architecture in Arabidopsis seed mucilage. Plant Physiol 169(1): 403-420. The Arabidopsis thaliana seed coat epidermis produces copious amounts of mucilage polysaccharides (Haughn and Western, 2012). Characterization of mucilage mutants has identified novel genes required for cell wall biosynthesis and modification (North et al., 2014). The biochemical analysis of seed mucilage is essential to evaluate how different mutations affect cell wall structure (Voiniciuc et al., 2015c). Here we describe a robust method to screen the monosaccharide composition of Arabidopsis seed mucilage using ion chromatography (IC). Mucilage from up to 48 samples can be extracted and prepared for IC analysis within 24 h (only 4 h hands-on). Furthermore, this protocol enables fast separation (31 min per sample), automatic detection and quantification of both neutral and acidic sugars. The manner in which seeds are produced, harvested and stored can impact the content and composition of mucilage (see recent review, Voiniciuc et al., 2015c). To facilitate comparisons between different genotypes, it is necessary to always grow plants under the same conditions. We recommend the following procedures, which yield high quality seeds and consistent mucilage chemotypes (Voiniciuc et al., 2015a; Voiniciuc et al., 2015b; Voiniciuc et al., 2015c). Using filter paper, sprinkle seeds on ½ MS plates, and seal plates with 3M Micropore Paper Tape. Germinate seeds under continuous light. After five to seven days (when the cotyledons fully open), transfer seedlings using forceps to individual pots filled with wet peat-sand-pumice substrate. Cover with plastic dome for one week. Grow plants under constant light (~170 µE m-2 s-1), temperature (20 °C) and relative humidity (60%), watering every two to three days as needed. Before flowering, cover each plant with an ARACON cone and tube to prevent cross-pollination and seed dispersal. Remove any branches that cannot be contained within the ARACON tubes. When most of the siliques turn yellow (almost 60 days after step A1), cut plants from their base and harvest mature seeds by shaking each plant into large brown paper bags for 10 sec. Note: To preserve the biological variation, use one bag per plant and do not pool seeds. Empty the contents of each brown bag onto a clean piece of filter paper and carefully remove the vegetative material using forceps. Transfer only seeds to small white paper bags. Prepare a spreadsheet for each experiment, with the relevant information (e.g., Sample #; Seed Weight; Seed Bag; Genotype). Up to 48 unknown samples can be processed at once. To simplify labeling and later processing, samples should be assigned a letter (e.g., experiment A) and a two-digit number, making sure that single digit numbers are preceded by a zero (e.g., A01 to A48). Pre-label the sides of 2 ml Safe Lock tubes with the sample numbers. Use an analytical balance to add 4-6 mg seeds to each tube and record precise weight in the spreadsheet. Prepare a dilution series of 9-Sugar mix standards by adding the volumes listed in Table 1 to 2 ml Screw-Cap Tubes. Prepare enough 30 µg/ml Rib (Internal Standard) to add 1 ml to all samples and sugar standards in one experiment. For a typical experiment with 48 samples and 10 standards, add 180 µl of the 10 mg/ml Rib and fill up to 60 ml with ultrapure water. Using a repeater pipette, add 1 ml of Internal Standard to all samples and standards. Perform the total mucilage extraction by shaking the seed-containing tubes for 15 min at 30 Hz in a ball mill using two 24 Tissue Lyser Adapters, at room temperature (~24 °C). Rotate block 180° and shake for an additional 15 min at 30 Hz to complete the total mucilage extraction. This detaches all mucilage from wild-type seeds (Figure 1). Figure 1. Ruthenium red staining of seeds after mucilage extraction. Wild-type (Col-0) seeds stained in a 24-well plate as previously described (Voiniciuc et al., 2015b), after gentle shaking in water (A) or the total mucilage extraction (B). Bars = 2 mm. Let seeds settle for at least 30 sec. For each sample, transfer 800 µl of the supernatant to a 2 ml Screw-Cap tube, pre-labeled on its side. Note: Do not transfer any seeds, and do not cap the tubes at this point. Dry samples and standards under air flow at 45 °C using the sample concentrator. Process all tubes identically from this point onwards. Using a repeater pipette, add 300 µl of 2 M TFA to all tubes. Note: Perform TFA work in a fume hood, with the appropriate personal protective equipment. Cap each tube tightly, and vortex for 3 sec. Transfer tubes to the Techne Dri-block (preheated to 120 °C) and incubate for 60 min. Cool heating blocks and tubes on ice. Centrifuge tubes for 30 sec at maximum speed. Uncap tubes, and evaporate TFA under air flow at 45 °C using sample concentrator. Note: Keep caps on a clean paper towel, in the correct order. Add 600 µl of autoclaved, ultrapure water to all tubes using a repeater pipette. Vortex mix for 3 sec. Note: If using medium shaking intensity and exercising caution, the tubes do not need to be capped for this step because the solution will not spill over. Transfer 150 µl from each tube to pre-labeled IC vials with inserts. Seal vials with caps. Place tubes in the autosampler of a Dionex DX-600 system in ascending order, but randomize (e.g., using Microsoft Excel) the injection order of the sample and standards. 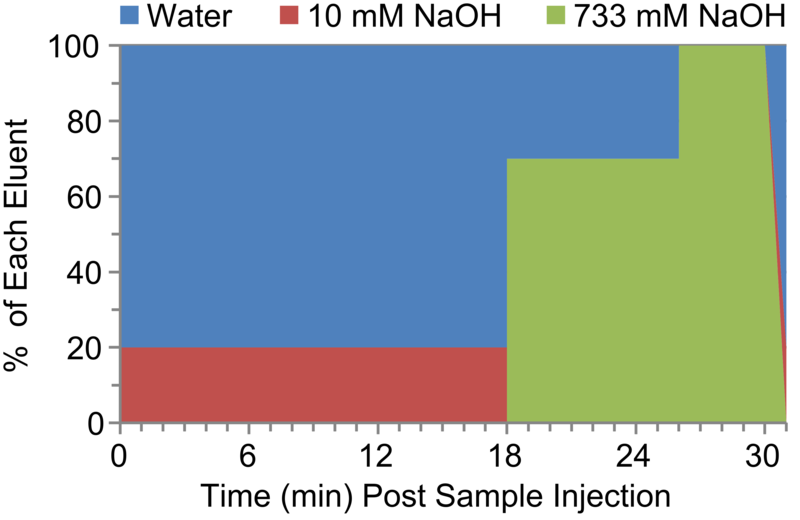 Separate and quantify monosaccharides by high-performance anion-exchange chromatography with pulsed amperometric detection (HPAEC-PAD) using CarboPac PA20 Guard and Analytical columns, at 40 °C and a constant flow rate of 0.4 ml/min. Ensure that sufficient volumes of the three IC eluents (ultrapure water, 10 mM NaOH, and 733 mM NaOH; Figure 2) are available to run all samples and standards in an experimental batch. Equilibrate the columns with 2 mM NaOH (80% water, 20% 10 mM NaOH) for 10 min. Inject 10 µl of each sample. Separate neutral sugars with 2 mM NaOH over the course of 18 min (Figure 2). Afterwards, pump 513 mM NaOH for 7.5 min to separate uronic acids (Figure 2). Finally, rinse the column with 733 mM NaOH for 4 min (Figure 2). Note: Repeat the methods in steps E3-7 for each sample and standard (Figure 2). Automatically annotate the monosaccharide peaks by configuring the Peak Table (Table 2) and the Detection Parameters (Table 3) in the Chromeleon Chromatography Data System software. These parameters work correctly for most standards and samples (Figure 3), and require only minor adjustments if the retention times shifts slightly between experiments. Note: Depending on your individual set-up and column age, you might have to adjust the flow rate or the NaOH concentration during the neutral sugar elution. Do not decrease NaOH concentration too much as this has an effect on sensitivity. Inspect chromatograms in Chromeleon to ensure that all peaks are correctly labeled. 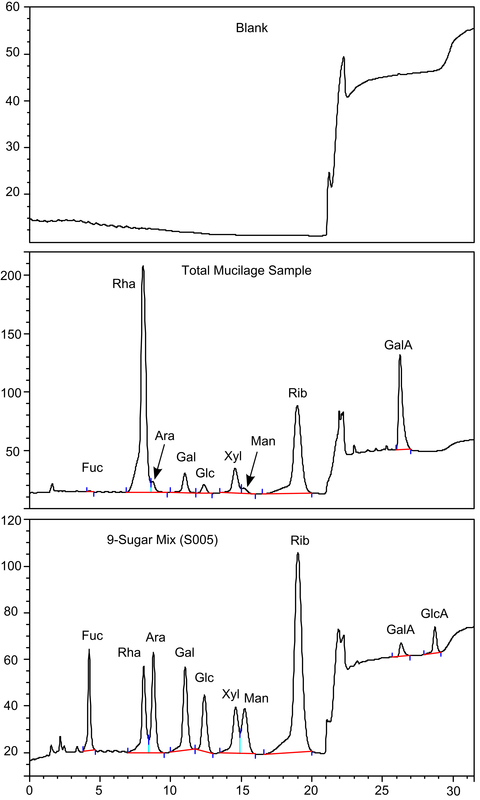 Manually annotate the peaks of Ara and Man if necessary, which overlap with more abundant sugars. By defining the standards and their concentrations in Chromeleon (Tables 1 and 2), calibration plots are automatically generated for all monosaccharides, normalized to Rib (Internal Standard). Note: Inspect the calibration plots and disable significant outliers if necessary. The amounts of all monosaccharides (expressed in µg) in a sample are automatically calculated based on the calibration plots and can be exported from Chromeleon for further calculations. Note: Fuc is detected in trace amounts in total mucilage extracts from Arabidopsis seeds (Figure 3; Voiniciuc et al., 2015c), while GlcA is generally not detected in these samples. Figure 3. Example chromatograms exported from the Chromeleon software. The vertical axes represent detected signals (nC). The horizontal axes show time post-injection (min). Further calculations are performed in Microsoft Excel. The monosaccharide composition of total mucilage extracts can be expressed as absolute (Figure 4A), or relative amounts (Figure 4B). Figure 4. Composition of total mucilage extracts from the Col-0 wild type. The data show means of three biological replicates. The error bars in (A) represent standard deviations. Sugar amounts (expressed in µg) can be divided by the amount of seeds (expressed in mg) used for each mucilage extraction, to calculate the absolute composition (µg sugar/mg seed). Note: The total amount of mucilage per mg seed is the sum of all sugar values in a sample. Absolute monosaccharide levels can also be expressed as the number of molecules normalized to the amount of seeds used. To calculate the nmol sugar per mg seed, divide the value obtained in step F1 by the molecular mass of the respective sugar (Table 4), and multiply the result by 1,000. Relative monosaccharide composition in mucilage can be expressed as a molar percentage (mol%), and equals the amount of each monomer divided by the sum of all sugars (both from step F2). Statistical analyses to compare the mucilage composition of wild-type and mutants can be performed in Excel. Significant changes in a particular monosaccharide (expressed either in absolute or relative amounts) between two genotypes with multiple biological replicates can be identified using the built-in T.TEST function. When many mutants (and their various sugars components) are compared to wild-type, conditional formatting (e.g., highlight cells with P-value < 0.05) can be used to quickly reveal which components are significantly altered. Two-Factor Analysis of Variance (ANOVA) can also be performed in Excel with the Real Statistics Resource Pack (http://www.real-statistics.com/) to evaluate how mucilage composition is affected by two independent mutations (via the analysis of wild-type, single and double mutant samples). For 500 ml solution (yields around 25 plates), mix 1.08 g MS basal salts, 3.5 g agar, and water. Autoclave, and pour media (while still warm) into sterile Petri dishes on a clean bench. When kept in a sterile bag, plates can be stored at 4 °C for at least 6 months. For each monosaccharide except GalA and Rha, prepare individual stocks by dissolving 100 mg sugar in 10 ml of autoclaved, ultrapure water in a sterile 15 ml Falcon tube. Since they are sold in monohydrate forms, use 109 mg of GalA and 111 mg of Rha rather than the standard 100 mg.
Aliquot the Rib stock into 2 ml Safe Lock tubes since it is frequently used. Store all stocks at -20 °C. For a 10 ml solution, mix 1 ml of water with 1 ml of Fuc, Rha, Ara, Gal, Glc, Xyl, Man, GalA, and GlcA (all 10 mg/ml stocks). Aliquot the 9-Sugar mix into 2 ml Safe Lock tubes and stored at -20 °C. The methods described here were derived from (Voiniciuc et al., 2015c), and were employed by (Voiniciuc et al., 2015a; Voiniciuc et al., 2015b). We thank Björn Usadel for helpful comments on the protocol. This work was supported by the Natural Sciences and Engineering Research Council of Canada (PGS-D3 grant to C. V.). Author Contributions: C. V. and M. G. developed the method. C. V. wrote the protocol. Haughn, G. W. and Western, T. L. (2012). Arabidopsis seed coat mucilage is a specialized cell wall that can be used as a model for genetic analysis of plant cell wall structure and function. Front Plant Sci 3: 64. North, H. M., Berger, A., Saez-Aguayo, S. and Ralet, M. C. (2014). Understanding polysaccharide production and properties using seed coat mutants: future perspectives for the exploitation of natural variants. Ann Bot 114(6): 1251-1263. Voiniciuc, C., Gunl, M., Schmidt, M. H. and Usadel, B. (2015a). Highly branched xylan made by IRREGULAR XYLEM14 and MUCILAGE-RELATED21 links mucilage to Arabidopsis seeds. Plant Physiol 169(4): 2481-2495. Voiniciuc, C., Yang, B., Schmidt, M. H., Gunl, M. and Usadel, B. (2015c). Starting to gel: how Arabidopsis seed coat epidermal cells produce specialized secondary cell walls. Int J Mol Sci 16(2): 3452-3473.